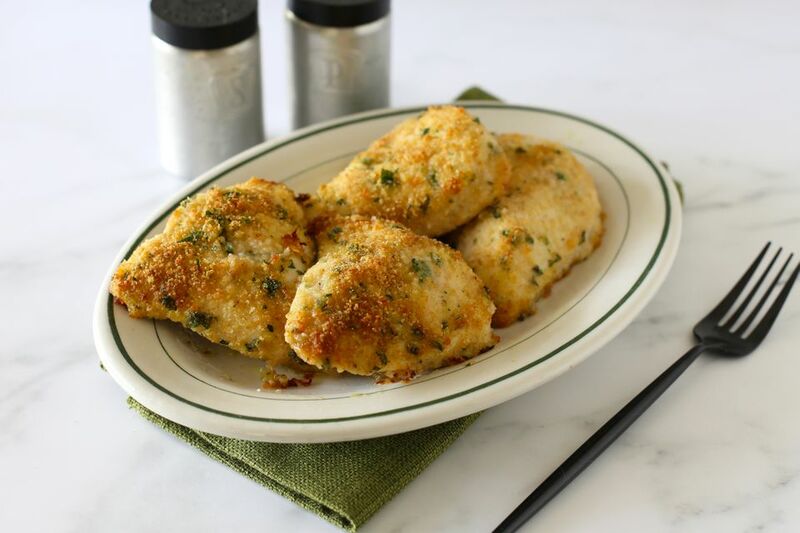 These moist breaded chicken breasts are perfectly flavored with Parmesan cheese and garlic, and they are super easy to fix. The chicken pieces are baked to perfection, making them lower in fat and calories than deep-fried chicken. This recipe makes enough for eight people, but it is easy to scale down for a smaller family or two people. Or scale it up for a crowd. A serving size of chicken is about 4 ounces, yet many chicken breasts are two to three times that size. If they are very large—8 ounces or larger—you might want to slice them horizontally to make serving-size cutlets. Because of the different sizes, it can be easy to overcook or undercook boneless chicken breasts. To ensure the chicken is done, check with an instant-read thermometer. According to the USDA, the minimum safe temperature for chicken is 165 F.
Serve the chicken with a rice dish or boiled or roasted potatoes along with your family's favorite side vegetables. Heat the oven to 375 F. Line a large, rimmed baking sheet with foil or parchment paper. Combine the butter and garlic in a saucepan and heat over medium-low heat until the butter has melted and the mixture is simmering. Pour the butter mixture into a wide, shallow bowl. Combine the breadcrumbs, Parmesan cheese, chopped parsley, salt, and pepper. Dip chicken pieces in butter and then roll them in crumb mixture. Arrange the coated chicken breasts on the prepared baking sheet. Bake the chicken for about 25 to 35 minutes. Large chicken breasts might take longer. The chicken is done when it reaches at least 165 F.
Chicken breasts can become dry when overcooked, so try to time them based on the size and thickness. Small chicken breasts or cutlets will take far less time than larger pieces. Large chicken breasts can take as long as 45 to 50 minutes, while small or flattened pieces will be done in as little as 20 to 30 minutes. A reliable instant-read thermometer is a handy tool to have in your arsenal. The minimum safe temperature for chicken is 165 F.
Many people prefer the stronger flavor of flat-leaf parsley, but curly parsley is just fine. Add more or less, as desired. For a crunchier coating, replace the fine dry breadcrumbs with panko crumbs. For a spicy coating, add 1 to 2 teaspoons of Cajun or Creole seasoning to the breadcrumb mixture. Reduce the salt to 1/2 teaspoon if the seasoning blend contains salt. For additional color, add 2 teaspoons of ground sweet paprika to the breadcrumb mixture. Or add smoked paprika for smoky flavor. Add extra herbs to the Parmesan and breadcrumb coating. Add about 1 tablespoon of finely chopped fresh chives or thyme. Or add about 1 teaspoon of dry Italian herb blend.